CHILD IN NEED OF CARE, or CINC cases, are juvenile dependency cases. These cases often begin when a child has been removed from their home by the police or a social worker. The police or social worker may remove a child from their home when they believe there is a threat of danger that they cannot protect the child from if they leave the child there. Sometimes, these cases come to court after a family has been working with a social worker, if the worker believes the family needs the supervision of the court. If parents cannot afford an attorney, both they and their children are provided attorneys for these types of cases. Adjudication - this is what they call a trial in juvenile court. It is the court hearing where the district attorney’s office must try to prove the child is in need of care, based on the claims made in their petition. Adoptive Placement - when a child cannot remain in their home, DCFS must find a place for the child to live. This may be in foster care or with a relative. If the people the child is placed with are able to adopt the child one day, this is called an adoptive placement. Agency - another name for the Department of Children and Family Services (DCFS) or child protective services. Also sometimes simply called "the state." Answer - a court hearing after the petition has been filed, where the parents may admit to all the claims the district attorneys has made, or deny them. If the parent denies, or says the claims against them are not true, the case will be set for an adjudication hearing. CASA - a specially trained volunteer who works with children in a child in need of care case. They report to the Judge about how the children are doing, what their needs are, and what the CASA believes is best for the child. 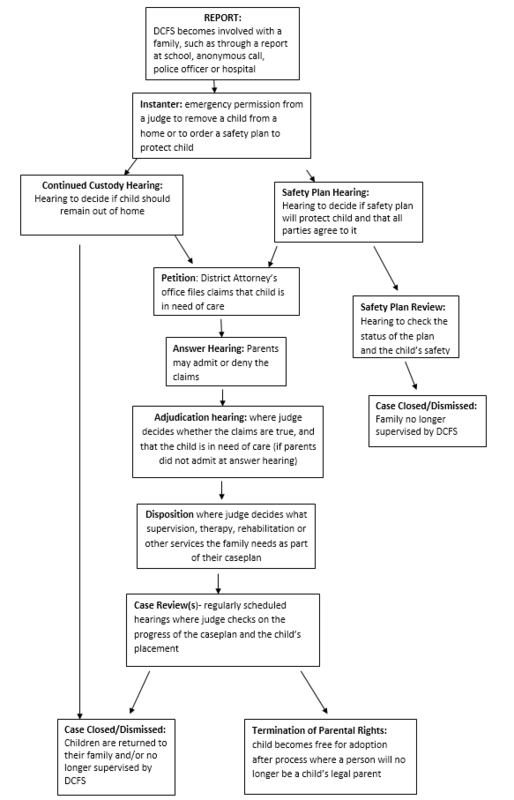 Case Plan - if the court finds that a child is in need of care, it will order DCFS to create a case plan. This case plan has tasks and goals to be done in order to fix the issues that brought the family to court. It may include, but isn’t limited to, the type of treatment, supervision, or rehabilitation the family needs. Case Review - after a case plan is ordered, the court will have court hearings to review the case plan in order to see check the progress of the parents, and decide if the child’s placement is still the best option at that time. Child’s Attorney - this is an attorney that represents the child during a child in need of care case. They do not work for the state, the court, or the parents. It is their job to work for what the child wants during the period of a case. Child in Need of Care - these are cases that deal with child dependency, not child delinquency. Usually, these cases come before the court because there is a belief that a child has been harmed or is at a risk of harm due to abuse, neglect, or abandonment. Continued custody hearing - if a social worker or police offer believes that a child is in danger and that that the only way they can protect the child is to remove the child from their home, a court hearing must be held within 3 days. At this court hearing, the Judge will decide whether they believe it is safe for the child to go back home or whether the child must continue to stay with a relative or foster family. DCFS - this is short for the Department of Children and Family Services, or child protective services. Sometimes also called the agency or simply "the state", DCFS investigates reports that a child may be in danger, abused, or neglected. DCFS also provides many services to families who need help. District Attorney - the attorney who works on behalf of the state, or DCFS, for a child in need of care case. This attorney files the petition, making claims that a child is in need of care. They try to prove to the Judge that the claims are true, and why DCFS needs to be involved with the family. Disposition - if the Judge finds a child is in need of care at the adjudication hearing, the next hearing is the disposition. At this hearing, the Judge will order a case plan for the family. Foster care - if the children may not stay in their home during a child in need of care case, they may be placed with relatives or with people they are not related to that have been certified by DCFS as foster parents. IDB - short for indigent defender board. This term is commonly used to refer to the attorney the Court appoints to represent the juvenile. Also called the public defender’s office. Instanter - when a social worker believes a child is at risk and that the only way they may protect the child is by removing the child from their home, they may get permission to do this from a Judge. This is called an instanter order. A Court hearing will then be held within 3 days for a Judge to decide if the child may now return home, or must remain in custody. Petition - a written request filed in Court by the district attorney's office that claims a child is in need of care and asks the Court to hear the case and make a decision. Public Defender - A defense attorney who works for parents who can't afford to pay for a lawyer. Public defenders work for their clients, not for the court or the state. Safety Plan - an agreement made with DCFS by the parents to follow certain conditions or rules to protect the health and safety of a child. This plan is done so that a child may remain in a home instead of being removed. If the child has already been removed, a safety plan may be made so that a child can return to the home. Visitation - the court may order that a parent can visit with their child that is not living with them at that time. The Court may order that DCFS or another person must be with the child and parent(s) during the visit, which is known as supervised visitation. Termination of parental rights - a legal action where a person’s parental rights are ended. That person will no longer be a child’s legal parent, and the child will be free to be adopted by another person. This is done in a separate case, but parents and children are still provided with an attorney.